Personalize your custom necklace to your heart's content. Laser-engraved, immaculate lettering and etching ensures that your message or artwork lasts as long as the necklace itself (i.e., a long time!). Phrases and symbols won't wash off or wear away. We offer many different colors for both your medical alert necklace as well as the lettering on it. You can even add your own custom artwork! Our silicone dog tag necklace is approximately 1" wide by 2" tall. The two blank sides give you up to 8 lines to put your name, address, phone, or any other key information. It has a 24" stainless steel chain to wear around your neck. We also offer an identical product but as a keychain with a 5" chain. We use the highest quality mixtures of industrial-grade silicone to make sure you're getting the toughest, most awesome medical id necklace ever. Silicone is stronger and longer-lasting than rubber, and Reminderband conducts ongoing tests and research to ensure our silicone medical alert necklace is the best on the market. For easy shopping, quality customer service, fast delivery, and best value, Reminderband is the company you can trust. 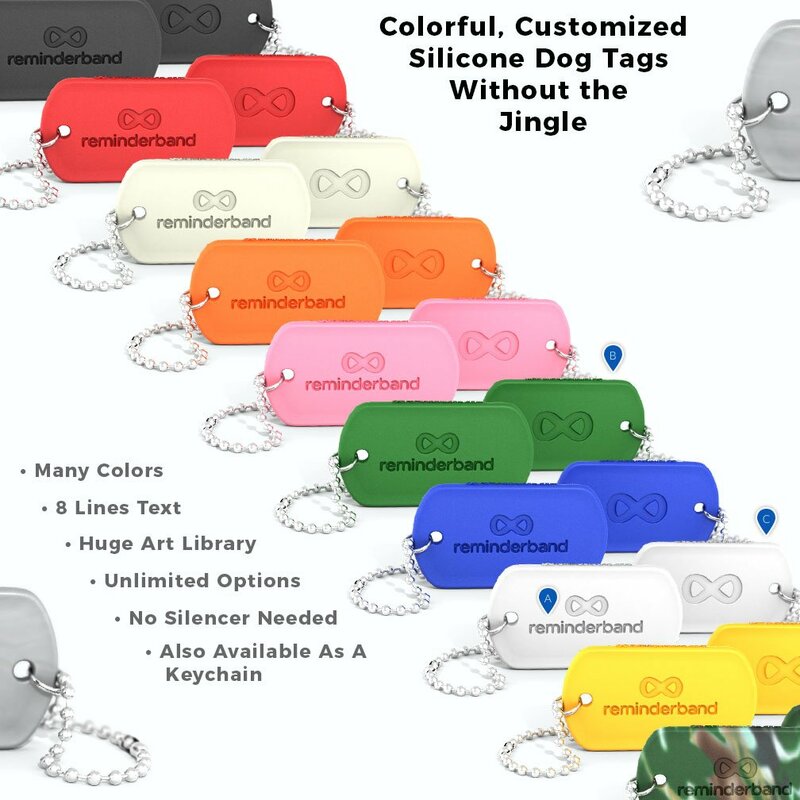 With multiple color and font options and no minimum order requirement, our custom silicone dog tags will meet your every need. Making your custom dog tags with our builder is easy. 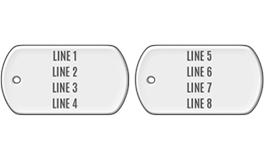 Our personalized engraved dog tags are a perfect fit for business branding, fundraising, medical alerts, awareness, sports teams, and personal reminders. We offer free engraving for your custom text, art, or logo. You can add as many as eight lines of text - four lines on each side of the tag - and additional color for the text or art. Our engraved dog tag necklace is approximately 2 1/4" x 1 1/4" and comes with a 24" stainless steel chain. You have many advantages with silicone tags as opposed to metal tags for your pet. One is the flexibility of silicone -- the tag is less likely to bend out of shape. Another advantage of silicone is the silence. You have no jingling or clanging every time your pet decides to move. We help your pet live in style with his or her own personalized tags. Pick the color and design that best fits your pet's personality and that adds greater visibility for you. 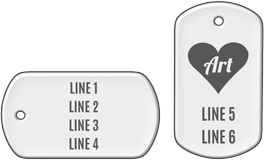 Order your engraved dog tag necklace online or call our friendly team at 800-922-5401 to learn more about our services and what we can do for you. 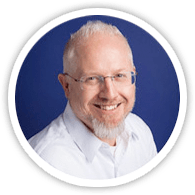 We will be happy to answer all of your questions, concerns, or comments. When you receive your Reminderbands, we want to make sure you do a happy dance. We individually wrap or package your order together in a clean, efficiently packaged plastic bag. We also get fancy and individually wrap each band for free! Our friendly customer service team is ready and willing to help you with any questions you may have.